A strange remake of asteroids. I really liked a bloopy sounding music in that. The gameplay was a bit above me but it was a creative take on this kind of puzzle game. Everything about it felt like a gameboy game. The art looked great. There were a few parts that sort of felt like a waste of time instead of an actual challenge like the area with the two shooting enemies on the third area. I ended up making it to that but didn't really feel like trying to get all the way back again. Felt a lot like a very polished gameboy game. I really like this mechanic. It was a lot of fun. The atmosphere in this was great. Thanks. I've looked at those a lot to try to fix them. Unfortunately, I have no idea what is causing it. The best way to get through them from what I've seen is to land on them only moving vertically. Sorry it's messed up. I've been thinking of making something similar to this for a while where you collect pieces. This was pretty fun. The art was thicc so good job on that. There does seem to be a bug where some enemies are just invincible after I attack them. Thanks. I don't remember if it started out serious but near the end it became a joke. Good job. My hard hurt after playing it too. SuperStarDreamTeam community · Created a new topic SuperStarDreamTeam is 94% Done! I really lost motivation for a while (and school, a lot of school). This will hopefully speed up development a bit. Also, writing text for the overworld took WAAAAYYYYY longing than I expected. Anyways, here is a random gif. I also made a door. SuperStarDreamTeam community · Created a new topic SuperStarDreamTeam is 91% done! So, I finally finished all the main levels. Now I just have to do some extra stuff and fix some things. I didn’t remember to upload most of the gifs to a place where I could get a link to them so have some contextless garbage that I did as a joke. SuperStarDreamTeam community · Created a new topic ​ SuperStarDreamTeam is 86% done! Hey, so I am half way done with the final area in SSDT and I did a few other little changes. I made it so that now SSDT has hit-scan bullets. There is also bullet spread now. I added this system to the enemies too. I changed the text system to be more customization. It will be a little harder to work with but I think it will be worth it. The last world is going to have different environments for each level. The first level was air ships. I think this level is pretty different to the other levels in the game. I really liked the color pallet and the music. The main problem I have with this is that it does not use the correct resolution. When I fell onto one of the points I got stuck in the place where the point was. I really like the gravity. It reminded me of Mario Galaxy. The sound and graphics were very nice but the game play was very glitchy. When I tried sprinting it made two players. The camera was wierd. Sometimes it wouldn't fallow the player and when you walked over to the side of the screen it would jump over. So, I got the fire world done. I wasn’t sure about it when I actually started working on it, but I think it is one of my favorite areas in the game. I fixed some stupidity I did so that the player can now fall. I did something early on that made it so that the player would only be able to fall from higher than the normal level height. I tried vertical level design which I think turned out well. It was pretty difficult compared to normal level design since I am not used to doing it, though. Large jumpy rock thing with cool looking meteor trail before I actually made the meteors do what they were suppose to. I’m out of school so hopefully that means that I will be able to get more done. I will probably spend more time than usual on Grinnside since it’s the last world and I wan’t it to be really good. So, first of all. This took a lot longer that it should of! I didn't work on SSDT much for a while. Second of all, I don't have a lot of screenshots to show, because I used to upload gifs to a website that didn't have very good gif Support. I used google plus to upload them there. I then used it for here too. I stopped uploading gifs to that website so I stopped uploading to google plus. I didn't think of uploading stuff here though so I don't have a lot of the gifs. So, next time I'll remember to upload stuff to google plus. I made a good character. I wrote something explaining the game. LINK! I made a mushroom shooty thing. I made a pretty cool LOOKING bossfight. This is the third to last world. I realized a while ago that I never fully explained SuperStarDreamTeam. I decided that now would be a good time to write about the game and explain some things that may have not been clear. When I started SSDT in August of 2015 I never thought I would be working on it for as long as I have been. It was supposed to be a practice game to help me work on making platformers. However, I am happy that this happened because my other project idea was not very good. The other idea I had was for a rouge-like. If I had worked on that it likely would have gotten lumped in with all the other indie rouge-likes that were being made at the time. The game's scope was decreased a few times near the beginning. The original idea was to have 8 areas in the game. Each area would have 2 boss fights. After I started working on the first boss fight I realized that this was too many boss fight and decided that 1 per area would be much easier. The game also originally was inspired by Undertale. It was going to have the option to kill all the enemies or not kill any of the enemies in each level. I soon realized that this would be really hard to design levels for and there would be very little incentive for people to do either option. SSDT takes a lot of inspiration from games such as Mario and Luigi series, Castle Crashers, and Chicken Sword. This can be seen in many of the boss fights and characters. I usually describe SSDT as a platformer/poor excuse for stealth game. I think this is a good explanation of it. A major mechanic of the game is its enemies. If they see you, you will likely die. This is because they shoot at you rapidly and can kill you in one shot. You must sneak around them and attack them from behind to get past them. The problem with this is that their A.I is about as complex as a Super Mario Goomba. They will not respond to you making a bunch of noise, seeing other enemies that are dead, or seeing muffin rockets flying at them. This was done to give them an amount of predictability. You are very quick and agile in the game. You have the ability to double jump and climb onto wall. You can pick up items to help yourself get through the levels. The game will hopefully be released in late spring/early summer of 2017. The final game will contain 32 normal levels, a base area that changes throughout the game, and a secrete level. I am not sure about a price yet but it will not be very expensive. Until then you can play a small demo I made that contains the first two levels of the game. I also plan on frequently posting updates and other fun things about the game for now on. Here is another update post! First, I forgot to do an update so there is twice as much progress as usual. That is why there is a big jump in the percentage. 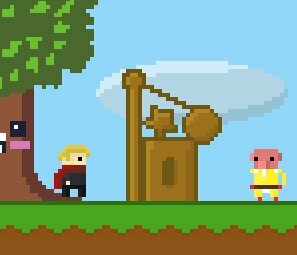 I also entered the 37th Ludum Dare while I was working on this. I got a bit sidetracked from that, but if you want to check out the game I made here is the Trailer. This is my favorite thing I did. I don't usually put music I make in these updates, but I really liked the one for this area. That is all I have to show for now. Some of the levels didn't have an interesting "core feature" to show. That is why there is so little stuff for so much I got done. I thought I fixed that glitch. Thanks for telling me about it. Nah. Do what you want. It would be nice to make the sounds match the game though. GBJAM 5 community · Replied to oxysofts in CMYK color scheme? I have seen people do some pretty cool stuff people have done with the four color restraint. I think this looks nice. Congratulations on releasing your first game.